This is a free online chat session with one of our IIBA® Certification recipients. Often times the CCBA® credential gets lost in all the hype of its big brother the CBAP®. So this month we will give information on the CCBA exam and experience. We will discuss all certification levels, but this month we have a CCBA mentor that will give their perspective and their journey to become IIBA® Certified, as well as provide tips & tricks on anything related to IIBA Certification from the application process to re-certification. Anyone interested in ECBA™, CCBA® or CBAP® certification is welcome to come and ask questions of our CCBA mentor. Andrew Lytle, CCBA works as a Business Analyst for NTT Data and the Commonwealth of Kentucky, supporting the Medicaid Waiver Management Application. He has several years experience in business analysis and project management specializing in data analytics, SQL report writing, technical analysis, business process improvement, supporting QA / UA testing efforts among other skills and techniques. Andrew is the newest Certification of Capability in Business Analysis™ (CCBA®) holder in the Bluegrass IIBA Chapter. Having recently passed the CCBA exam, he can provide very current information on the application process, exam and overall experience. Andrew participated in the 2017 BABOK v3 Study Group and 2018 BABOK v3 Study Group provided by Bluegrass IIBA Chapter, and passed the CCBA exam on September 17, 2018. 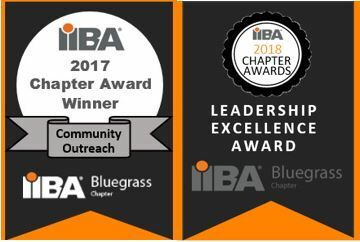 Andrew now serves the Bluegrass community as Bluegrass IIBA Chapter Recognition Program Director. You can often find him at chapter meetings in Lexington or on LinkedIn.